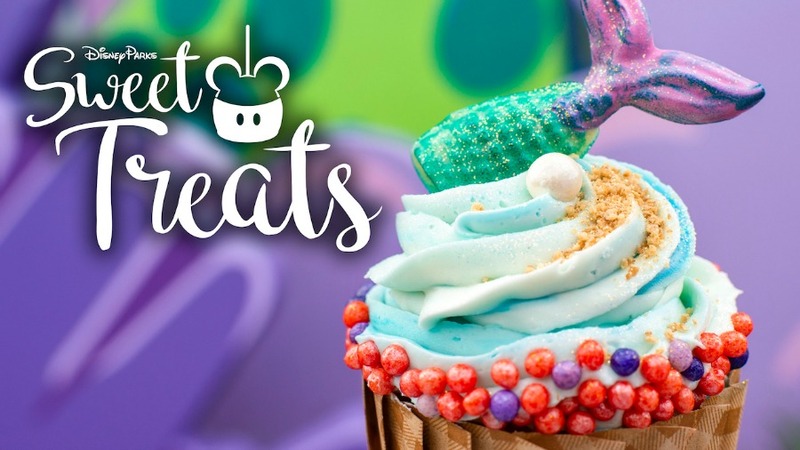 Arriving just in time for Valentine’s Day is the list of sweet treats guests will find available around the Walt Disney World Resort. 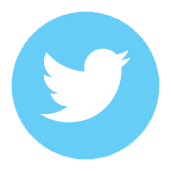 First on the list is the cupcake above which is available at Landscape of Flavors at Disney’s Art of Animation Resort. This Mermaid Tail Cupcake is made with a vanilla sponge then it’s filled with pineapple compote and topped with coconut buttercream, crispy pearls, graham cracker crumbs, edible glitter, and a white chocolate mermaid tail. 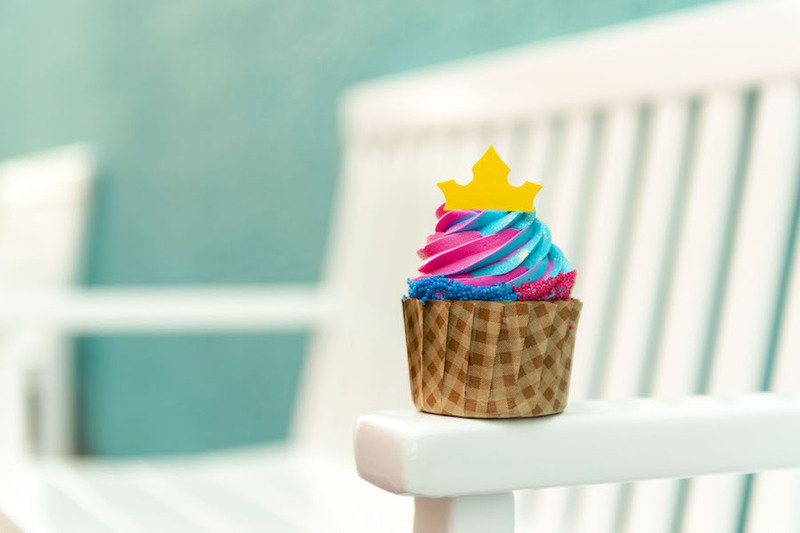 Next up is the Princess Aurora Cupcake that is available at the Intermission Food Court at Disney’s All-Star Music Resort through the end of the month. This one is a vanilla cupcake with cotton candy buttercream. Available at Creature Comforts and Restaurantosaurus, this yellow vanilla cupcake above on the left is filled with strawberry mousse and topped with a blooming purple buttercream lotus flower to mimic what’s seen in the Rivers of Light presentation. Above on the right is the Simba Cupcake which is a yellow vanilla cupcake that’s been filled with a white chocolate mousse and topped with buttercream, an edible piece featuring Simba, and a mane of orange and yellow icing. Look for this dessert in Disney’s Animal Kingdom at Isle of Java and Pizzafari. New this month, the waffles during breakfast at Tusker House Restaurant are now themed to Simba and Nala from Disney’s The Lion King! Guests visiting the Norway pavilion at Epcot can stop by Kringla Bakeri og Kafe to try Sven’s Apple Cheesecake – it’s not just apple-shaped, but it’s also filled with apples. 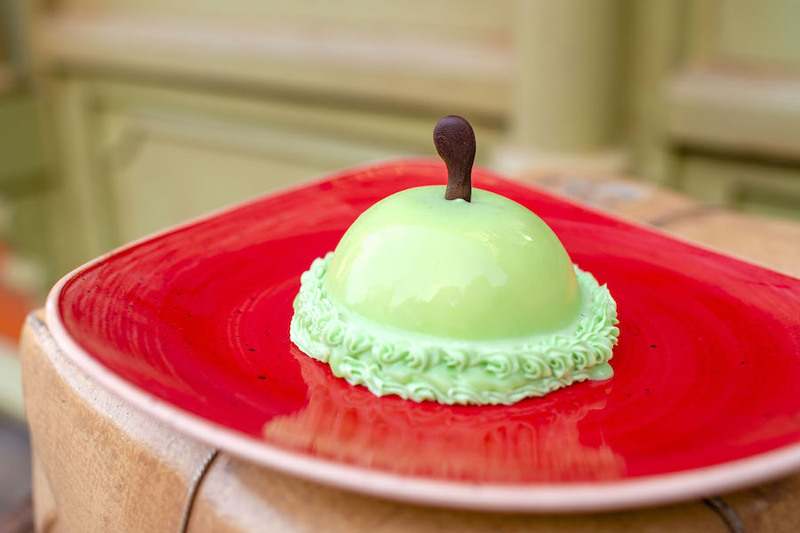 Another special dessert is available through the end of the Epcot International Festival of the Arts on February 25 at Sunshine Seasons in The Land pavilion. 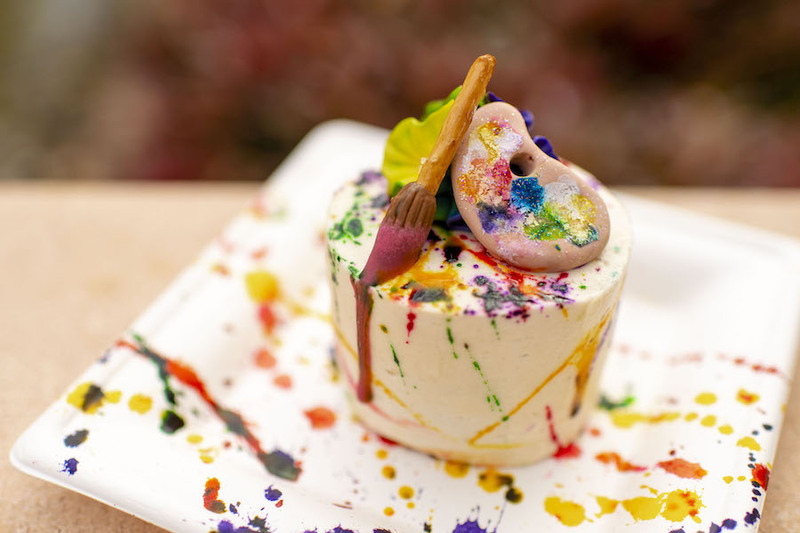 This one is a multicolored vanilla cake that is splattered with color then topped with peanut butter buttercream and a tiny paint brush that’s made with a pretzel stick and chocolate. 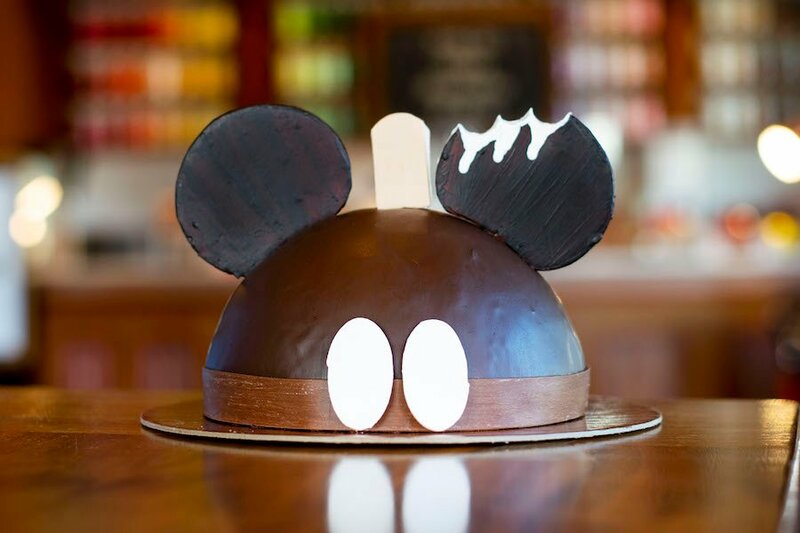 We told you earlier this month that Amorette’s Patisserie recently added a new dome cake design to their list – the Mickey Premium Bar Dome Cake. This cake has fondant buttons and ears made of chocolate, but guests can choose what’s on the inside. 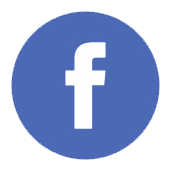 You can place an order by calling (407) 934-3500 or by visiting the shop at least 72-hours in advance.